An easy to read large computer LCD display that indicates calories burned, distance, time, speed, scan, pulse and odometer.Please refer user manual attached below for instructions and troubleshooting steps. 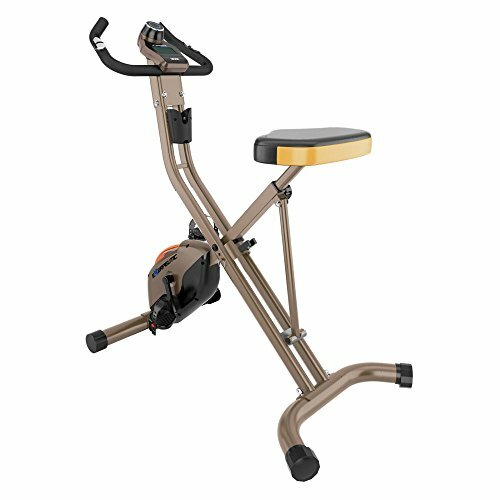 Even if you’re living in a New York-style efficiency apartment, you’ll always have room to hit the road on the Exerpeutic 500 XLS Foldable Magnetic Upright Bike. This innovative bike gives you a way to get in a quality cardio workout right in your home. This bike uses magnetic resistance, so you’ll be able to pedal your way to your fitness goals. Additional Information: Large, padded seat Adjusts to fit users from 5 ft., 1 in. to 6 ft., 5in. Foldable frame stores easily when not in use Padded, multi-grip handlebars Adjustable pedal straps About Exerpeutic: Health shouldn’t come at a high price. That’s the philosophy behind Exerpeutic, a division of Paradigm Health and Wellness Inc., devoted to offering high-quality products at value-oriented prices. Exerpeutic has a fitness plan for virtually every body and budget. Features: Powder-coated steel frame. 3-piece crank system and double-drive transmission. 8 resistance levels. LCD display shows calories burned, distance, time, speed, scan, odometer and pulse. Heart-rate sensors in the handgrips. Weight capacity: 400 lbs.. Dimensions: 39L x 26.4W x 48.4H in..